In Greek mythology, the maiden, Daphne, had herself transformed into a laurel tree to escape the amorous attentions of the god, Apollo. So if laurels were called daphnes, I could understand that. But they aren't. Laurels, members of the Lauraceae family, aren't even in the same family as the shrubs we call Daphnes, who are members of the Thymelaeaceae family. About the only reasons I can think of that these shrubs were named for the lovely Daphne is because of their beauty and, above all, their fragrance. Winter Daphne, Daphne odora, fills the air in winter with it's intense perfume. Daphne x burkwoodii 'Carol Mackie,' shown above, blooms in my Seattle garden in April, filling the space with a subtler scent - one that I find a welcome companion while I am working outside. Daphnes tend to have an attractive form and require little pruning. Some cultivars have white or creamy margins on the leaves (see above) that give them visual interest even after the flowers have faded. 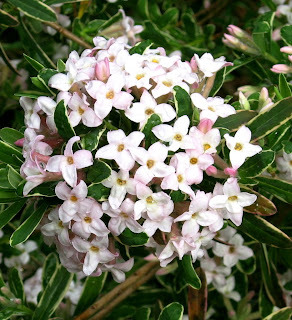 Although Daphnes are popular shrubs in the Northwest, they have a reputation for being fussy. They can be planted with all the loving care and attention you can muster, and yet fail to grow. They don't like soil that is too wet, but they don't like to dry out, either. They seem to be doing well, then suddenly, and without warning, die. There is a trick, however, that you can use to increase the odds of your Daphne's survival. I've been using this trick with great success for almost 20 years. It is simply this, plant your Daphne near a concrete walkway or (better) throw a couple of pieces of concrete rubble into the planting hole. The reason this works is this. Our soils in the Northwest are acidic, perfect for acid lovers like rhododendrons, azaleas and blueberries. But plants, like Daphne, that prefer more alkaline soil, struggle. The lime contained in the concrete leaches into the soil a little bit each time it rains or when you water. That lime sweetens the soil around your Daphne slightly, making for a much happier plant. And when Daphne is happy, she brings beauty to your garden.